Lunch begins at 11:45 am, the Presentation will begin at 12:00 pm. Women and under-represented minorities are more likely to fall out of the STEM pipeline at every stage from middle school on. Why do we need to address this issue? What can we do in our classrooms, departments, and institutions to ensure that everyone has an opportunity to succeed? Research suggests that interactive teaching methods, in contrast to passive lectures, might help us successfully address issues of diversity. Why do they work? What else must we do to make the STEM world and others more equitable? Please RSVP Online by 5:00 PM, Friday, November 2, 2018. 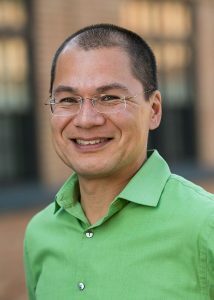 Dr. Dave Kung’s varied interests are a perfect match for a liberal arts institution like St. Mary’s College of Maryland. In addition to teaching mathematics, using his degrees from the University of Wisconsin – Madison, he plays violin with students and the local community orchestra, runs with the cross country team, and marches alongside campus activists. He has authored a variety of articles on topics in harmonic analysis and mathematics education, and is the recipient of numerous awards including the 2006 Teaching Award and the 2017 Service Award from the MD/VA/DC section of the MAA. His passion for leveling the playing field for women and minorities in STEM fields has led to creation of an Emerging Scholars Program, an REU, and a math circle. Two Great Courses lecture series, on math/music and mind-bending paradoxes, have engaged audiences around the world. He serves as director of MAA Project NExT, a professional development program for new faculty in the mathematical sciences.